Also, Ika in that yellow dress. Wow. Did not see a William HOH coming, pretty pumped for a power shift week though! Emily: "[Cassandra] was definitely the villian of the show"
Gary: "Oh, honey, you don't know who the villain is until you watch it." Emily: "[Cassandra] was definitely the villian of the show"Gary: "Oh, honey, you don't know who the villain is until you watch it. "I'm dying!! Right I felt sooo bad for Neda when she was crying and even when Sindy put her up. I didn't. I got chills everytime the crowd cheered. Missed Monday's epi. Is it worth watching? I thought it was decent and plus we got some good family moments. I thought it was Jackie or ika? It's a triple? How?I thought it was Jackie or ika? It's a triple? I'm proud of my Melanin Queen. She keeps breaking barriers and I'm here for it. Now she needs to cut off Kevin. Ika DID that all season no matter what happens. But Kevin is HOH now so rip Demika :). Jackie waited until she was safely up the stairs to pull that stunt. She knew she'll get scalped. Queen Ika in the Final 5 <3 Hoping that Karen wins the POV and Dillon is forced in the block so Kevin has the odds against him at F4. 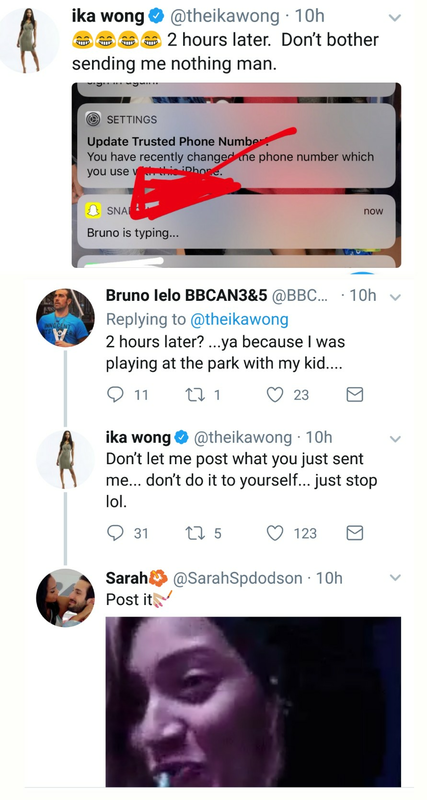 Ika slaysssssssssssssssssssss they need her on BBUS! The second one had me dying of laughter. The first one is reminder of how STRESSFUL it was being an Ika stan. She would fight EVERYONE on that show weekly but she somehow survived week after week. I always thought she was going to go home next. What an icon. They also had one where the brothers licked the other one's armpit but I didn't post the link because the brothers were trash, that moment was disgusting, and we should never talk of either again. But if You want to look, it's on their Twitter.